Everyday new electrical devices and appliances are offered to us. As an example, just a few years ago a television required one electrical outlet. Now, to watch TV we must power the television, the cable box, the high definition converter, the DVD and surround sound system. Older homes do not have the quantity of receptacles that a new, modern home needs, to conveniently power these devices. Adding a new electrical outlet (receptacle), (Figure 1) to an existing circuit is not a complex project and most home handymen should have few problems in completing the project. 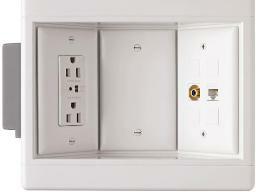 If this electrical outlet (receptacle) is for a flat panel TV, and includes electronic signal connections the finished box may look similar to Figure 1a. Remember that adding an electrical outlet does not increase the available power on that circuit. If you are having a breaker trip or a fuse blow, adding another electrical outlet will not correct the problem. On the same note, if you have a circuit which is near its maximum load, adding an additional outlet (which one supposes is meant to power some device), may be enough to cause the circuit to trip the breaker or blow the fuse. The physical challenge of getting the electrical cable from point A to B. The first determination is to locate the spot for the new electrical outlet. You want this spot to be a hollow wall and not directly on top of a wall stud. Using a piece of masking tape mark this location. Do not start cutting or making any holes in the wall. Once the physical location has been identified, you must determine how you will get power to the electrical outlet. Your choices are; any other electrical outlets or light fixture or switch box that contains un-switched live power. "Un-switched live power", is the key phrase, not all light fixtures or switch outlets contain live power - all the time. Figure 2 - Electrical box for a switch, with one cable will not have "live power" in the box. Electrical box for a receptacle, with one cable, providing it is not also controlled by a switch, will have "live power" in the box. Figure 3 - Electrical box with two or more cables will have live power in the box. Figure 4 - A pull chain lamp holder, providing it is not also controlled by a switch, will always have live power in the electrical box. It is relatively easy to determine if you have un-switched live power in an electrical box. 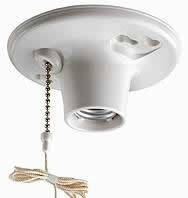 If it is a switch box, remove the cover plate, if it is a light fixture remove the fixture. and see how many electrical cables (see note) currently are in the electrical box. If it is a receptacle, remove the cover plate, and see how many electrical cables (see note) are in the electrical box. If there is only one it is 99.5% that you have un-switched live power in that electrical box. The only exception would be if there is a switch in line with the receptacle in another electrical box. This would be unusual, but it is possible. 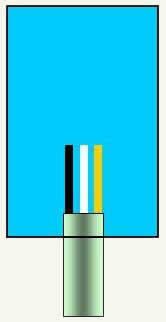 Note: An electrical cable is a grouping of two or more electrical wires within a common sheath. If there is only one cable, see Figure 2, you do not have live power in the electrical box and hence you cannot connect your new receptacle from this electrical box. There is one exception and that is with light fixtures. If the light fixture is a lamp socket with a pull chain, you will always have live power in that electrical box, see Figure 4. If the electrical box has two or more cables, see Figure 3, you will always have live power in that electrical box. In a situation where you have 3-way and 4-way switches, only the first switch in line has live power all of the time. If you follow the highlighted links you can find specific information on these types of circuits which should help you determine if you have live power in a 3-way or 4-way switch configuration.